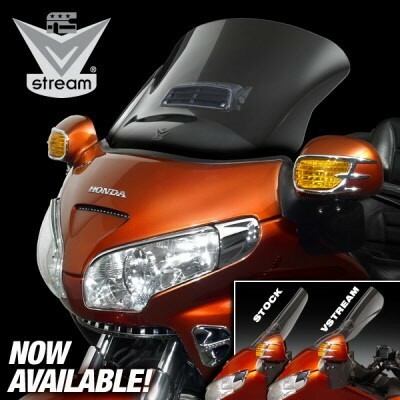 GL1800 Windshield Goldwing GL1800 VStream Replacement windscreen With Vent Opening N20012A The new VStream for the GL1800 features 4.5mm (33% thicker than stock) Lexan® polycarbonate for outstanding optics and impact strength 23X better than acrylic. Then we added our exclusive Quantum™ hardcoat for scratch resistance 10X better than FMR coating and 30X better than acrylic replacement screens. This is one tough windshield! The VStream's larger size and 2.5" setback create a quiet and comfortable ride you're sure to appreciate.